It looks as if Mac OS X Mavericks won't be as nonconformist as its name suggests. The Mac operating system update is reportedly being readied for an October release date as the crowd widely expects. Apple plans to release OS X 10.9 at the end of next month, according to 9to5Mac citing unnamed sources "with knowledge of the launch plans." 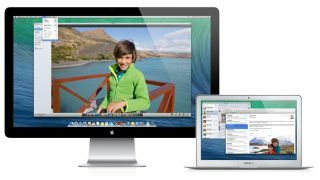 This would be in line with the previous two Mac OS X updates, Lion and Mountain Lion, which released the day following an Apple earning results release in the summer of 2012 and 2011. Apple's fourth quarter numbers are expected in the second half of October. OS X 10.9 alongside iPads? The October OS X Mavericks release date report dispels previous far-fetched rumors that it was going to launch alongside iOS 7 and the likely debut of iPhone 5S and iPhone 5C next week. It looks like Sept. 10 will be all about the new iPhone handsets. Instead, OS X 10.9 may share the stage with the announcements of the iPad 5 and iPad mini 2. The tablets are expected to be refreshed next month with tighter dimensions and a Retina display, respectively. A MacBook Pro with Haswell's all-day battery life is also thought to be due out in October, meaning Apple employees and fans might be in for a busy holiday season. OS X 10.9 is shaping up to be an update that Mac power users are going to benefit from the most, especially in the area of controlling multiple displays. They'll also appreciate the ability to open multiple tabs in Finder windows, apply tags to file for easier organization and reply within notifications. Everyone will see improvements in the way full-screen apps work and be able to experience new applications like Maps and iBooks on the computer. The latest beta, Developer Preview 7, was seeded to testers earlier this week, as the expected October release date nears. Check out the OS X Mavericks system requirements.